Disneyland and Disneyworld have renewed and updated their military discount for admission tickets in 2017!!! Sale begins Nov. 1 2016 and expires Dec. 16 2017. Blackout dates include 4/9/17-4/23/17. Tickets can be bought now through Dec 16 2017, but can only be used Jan 1-Dec 19 2017. Blackout dates include 4/9/17-4/23/17. Tickets are basically 50% off when it comes down to it. How many tickets can I get? You may purchase up to 6 Military Promotional Tickets. 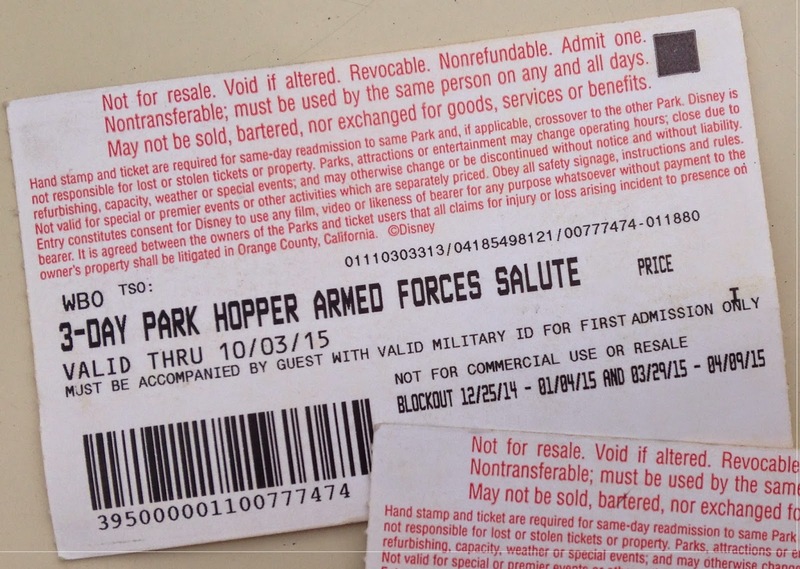 The tickets may be purchased by the service member or their spouse. This means if the husband/wife was deployed, the spouse could still take their family for example. You can buy tickets form your base ticket office if you have one or you can purchase them from the official Disney ticket windows. The advantage of buying them from your base would be that they would be tax free. My wife and I and our kids recently went to Disneyland. Check out our experience below! You can go to any branches ticket office. I am Army and I went to the Air Force Academy's Ticket Office. If you are not near a military base you can actually order them over the phone but that is a complicated process and takes several weeks. You can also buy them at Disneyland but you may have to pay additional taxes where as the tickets are tax free on base. 2.) Go to the office and pay for the tickets. 3.) Bring the vouchers to Disneyland and present them at one of the normal ticket lines. They will issue you your official 3-day-pass (see photo below). They take a picture of you and that picture comes up on a screen each time you try and enter the park. The service member or spouse must be present at the gate. 4.) Have a blast at the park. We went on Saturday, Monday and Tuesday. You don't have to use the passes on 3 consecutive days. You could go once in May, April, and June if you wanted.